One of the greatest things about working at a community-owned co-op is that we get to work with the local producers that make the unique products that our shoppers love. Even more than that, we get to know the people behind the product. 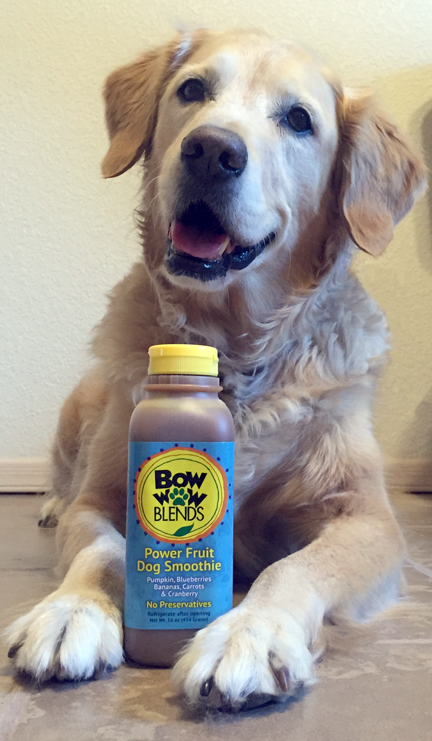 We're excited to introduce to you the folks behind Bow Wow Blends Power Fruit Dog Smoothies, a locally-produced smoothie for dogs- that's good enough for people to drink! Meet Ruby - the sweet pup with tummy troubles and inspiration for Bow Wow Blends. How did Bow Wow Blends get started? Ruby, our Golden Retriever, had been ill and was on lots of meds including Metronidazole. One morning after returning to bed with Ruby to snuggle, we were startled awake by her kicking. When we opened our eyes, we thought we would see Ruby running in her dog dreams but instead found her having a bad seizure. We believe that it was a neurotoxicity to Metronidalzole. We immediately took her off the drugs and started researching what we could give her so she could eat and keep the food in long enough to get the nutrients she needed. We switched her food to one with ingredients we thought wouldn’t irritate her. It was trial and error until we found one. During this process, we did research on foods and what helped and what didn’t help dogs with tummy issues and we started making this dog-safe fruit smoothie for her - and of course she shared it with her sisters. In the beginning, the dog fruit smoothie that was to become Bow Wow Blends, was first made only for Ruby and her sisters. We would pour it over their food and freeze some of it for them to enjoy as a cold treat. Then one day while visiting a friend that has a food processing facility a light bulb went off and we thought ‘Why not let other special babies enjoy a fruit smoothie chocked full of healthy ingredients?’. We made an appointment with the New Mexico Department of Agriculture to see what we needed to do to take a pet product to market and consulted with the New Mexico Food Sciences Lab as well for getting the product ph levels right. We also researched the packaging and wanted it to be made in the USA and BPA-free since it was going to be put in the same packaging humans use for their fruit smoothies. What products do you currently produce? The Power Fruit Smoothie for Dogs is currently our only product. We are working toward expanding the line. Tell us more about what sets Bow Wow Blends apart. All of our ingredients are human-grade and USA sourced, except the bananas since they don’t grow in the US. Our bottles and easy-pour lids are BPA-free and made i n the USA. We do not use any preservatives or thickening agents, like guar gum, so the product must be shaken by the consumer before use. Stuff does settle because we chose not to use a thickening agent but we wanted our product to be as pure as possible. I don’t think our customers mind shaking it before serving. Our product is shelf stable for 18 months, but must be refrigerated once opened. It makes fantastic frozen treats, so it’s a dual purpose that can be poured over your dog’s food or frozen. One bottle, two options! Bow Wow Blends is one of our favorite pet products. We carry it year-round in the household and pet department. Give it a try. We’re sure that your dogs, and you, will love it as much as we do!